Project Y’S Women in Theater festival at IRT continues with Cindy, written by Amina Henry and directed by Michole Biancosino. This modern update of Cinderella has some surprise twists which I found very empowering for children and inspirational for me (a grown-up parent of a girl somewhere below princess age). Cindy (Star Kirkland) is a thirteen year-old girl whose mother has died. 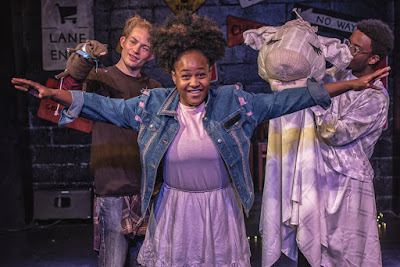 Fortunately, she gets good advice from her friend Rudy the rat (voice and puppetry by Zach Fifer). Her father, James (Joachim Boyle) tries to look out for her best interests, but he is not strong enough to resist his new wife, Cindy’s Stepmother (Rachel E. Evans), whose ego proceeds her. A very caring cow named Bell (voice and puppetry by Caleb Antony Green) lingers in the background, ruminating on Cindy’s future. Suddenly, the teenage Prince Rupert (Timiki Salinas) is ready to wed and throws a series of balls to find himself a marriageable girl who wants to be a princess. The Stepmother’s daughters, Sarah (Veronica Cooper) and Suzy (Emily Ma) prepare to be sassy for the Prince, and make sure that Cindy will be helping them prepare for the ball rather than competing against them. Much classical music related to Cinderella appears in this piece; Sarah and Suzy’s leitmotif is “Run the World (Girls)” by Beyoncé, sometimes thought of as a female power song. Meanwhile, Cindy dreams of being a pilot, something she knows she would enjoy more than being a groupie to royalty. Now, the magic begins. Honest Rudy the rat, loathed by the Stepmother and others who prefer image to integrity, helps Cindy get to the ball. So does Bell the cow, who has the spirit of Cindy’s late mother. They provide the glass slippers (or superfly hightops) and carriage (or shopping cart) that takes Cindy—or should I say incognito “Princess Ella”—into society and brings her home at midnight. Prince Rupert is a tall, jewel and cape-wearing party professional. His gold and sparkly shoes and ripped jeans mark him as cool, though Cindy is not impressed. Dancers thrill to the sounds of bhangra and congas, while Prince Rupert finds Cindy so refreshing, he does a split. Cindy, with a thirteen year-old’s strength of will, tells him she wants to fly, and barely gets home on time. One glass slipper remains in the prince’s clutches. When the prince comes to the Stepmother’s house, she happily trots out her daughters and does everything to deceive the prince into believing that they are Princess Ella. Sarah and Suzy each have a toe chopped off, but they can’t satisfy Prince Rupert that they wore the slipper at the ball. Finally, the prince finds out that “Ella” is Cindy. Her friends and family all want the best for her. But will she marry the prince or find a way to take flight on her own. Playwright Amina Henry has written a play that appeals to young people but frees itself from the fairytale form. Amid fanciful moments, we see a Stepmother who does terrible things to her own children and a stepchild who chooses her own destiny. Director Michole Biancosino makes sure that the humans and animals onstage never have a dull moment. Annie Ulrich’s costumes are flashy, contemporary and exciting, and the animal puppets are haunting and beautiful to behold. Hallie Zieselman’s set includes lots of signs and clues about the play for young viewers to discover. Sound designer Amit Prakash did a great job with fancy interlude music and exciting dance tracks for the ball. Christina Watanabe’s lighting shows us Cindy’s loneliness and difficulties as well as the love she receives from her friends and spirit animals.